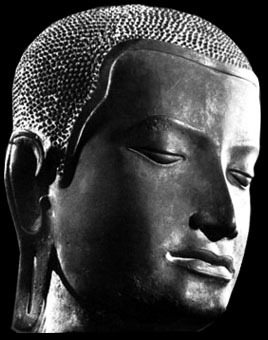 Siddhartha Gautama, known as the Buddha, was born in the sixth century B.C. in what is now modern Nepal. His father, Suddhodana, was the ruler of the Sakya people and Siddhartha grew up living the extravagant life of a young prince. According to custom, he married at the young age of sixteen to a girl named Yasodhara. His father had ordered that he live a life of total seclusion, but one day Siddhartha ventured out into the world and was confronted with the reality of the inevitable suffering of life. The next day, at the age of twenty-nine, he left his kingdom and newborn son to lead an ascetic life and determine a way to relieve universal suffering. That night Siddhartha sat under the Bodhi tree, and meditated until dawn. He purified his mind of all defilements and attained enlightenment at the age of thirty-five, thus earning the title Buddha, or "Enlightened One". For the remainder of his eighty years, the Buddha preached the Dharma in an effort to help other sentient beings reach enlightenment. Gepost door DA op 12:54 p.m.
interesting....did his son figure in The Middle Way? I did not know the history of Buddha. Thank you for this instruction. That is the most beautiful rendition of Buddha's face I have ever seen. You offer so much beauty in your postings. Beauty feeds the spirit. It calms and soothes and refreshes me. I try to come to your postings just before I am ready for bed. All the busy-ness and tensions ease. I think this site will be a favorite. I really like the story of Buddha. The story of how he became an enlightened being. It gives inspiration to me. I could not understand that why do you use a picture of dog as Buddha.